It’s creepy, the way social media throws up ‘Watch This’ or ‘Read This’ suggestions. From the usual food videos, discounts by travel companies, cute baby and pet videos and sitcom snippets to the more unusual ‘trending’ and ‘viral’ videos of people barfing, crazy challenges, strange habits, there’s a constant barrage of visuals. While I’m still wondering about that string of reptile videos that popped up in the explore section on my Instagram account recently – I am not a fan of the creepy crawlies – Facebook surprised me in a good way with a commercial that popped up on my timeline. Made for a beverage company, this commercial titled ‘My first train journey’ touched every emotional chord in my heart, leaving me teary eyed. Memories of 48-hour train journeys undertaken from the western part of India (Gujarat) to the eastern corner (West Bengal) to spend the annual summer vacations at the grandparents’ homes resurfaced, leading to a lovely memory reviving session with the parents. Life was a gala ride as soon as one boarded the train – looking for playmates, befriending uncles and aunties, dangling by the foot rails in an attempt to climb to the top bunk – there was so much to look forward to. It was three days of playing board games, antakshari (a musical game), reading the much treasured comic books. And the food! Every station had its speciality and my parents would treat us to all of it. But only after the ‘ghar ka khaana’ (homemade food) was over. I never did understand or appreciate the effort that my mother put into making food that would remain unspoiled for an entire day. And I am talking about when AC bogeys are a rarity. 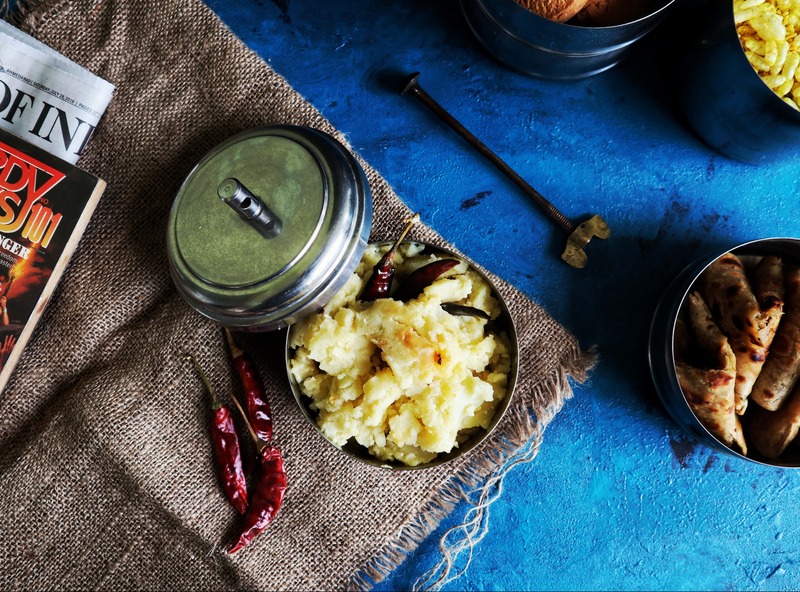 Today’s not-so-pretty and simple potato dish is a throwback to the tiffin that Maa would cook and pack for us. The food had to be healthy, non messy, tasty and remain unspoiled for more than 24 hours sans refrigerator. Enter the picture, the aloo morich which is potatoes mashed and cooked in chilli flavoured oil, seasoned with salt. Three ingredients used to add flavour to the humble potato, this dish can be paired with roti or paratha, is good enough to eat on its own and can also be used as stuffing for your grilled sandwich. Versatile it is. Did I mention it takes a maximum of 10 minutes – and that is stretching things – to make? Give it a try and let me know what are the other foods you remember eating during those train journeys from our childhood. As for the commercial, here’s the link to Paper Boat ‘My First Train Journey’. Boiled potatoes, mustard oil, dried red chillies, sugar and salt. Potatoes mashed and cooked in mustard oil flavoured with dried red chillies. Cut the potatoes into halves and boil them. Once cooked, cool and remove skin. Mash roughly – use your fingers – and set aside. In a non-stick frying pan or kadhai, heat the mustard oil on low flame. Once the oil is hot enough, break the two dried red chillies by half and put them in the oil. Add the asafoetida. Quickly add the mashed potatoes into the cooking vessel. Mix and mash till the flavoured oil and potatoes are combined well. Add salt and sugar. Mix well. Check the seasoning and adjust the salt. If you would like the potatoes to be a tad bit spicier, add some red chilli flakes. Remove from flame and serve hot. You can also serve this cold. As mentioned earlier, this is perfect in almost every way!